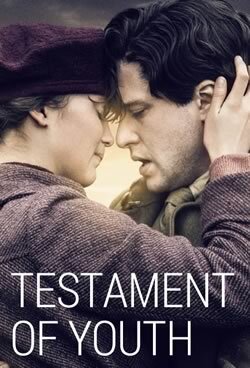 Testament of Youth is based on the best-selling First World War memoir written by Vera Brittain. Vera (played by Alicia Vikander, Ex Machina, The Man from U.N.C.L.E.) overcomes her family’s objections and is accepted as a student at Somerville College, Oxford. When World War I breaks out, she leaves college to join the Voluntary Aid Detachment as a nurse and follows her brother Edward (Taron Egerton, Kingsman: The Secret Services, Legend), her fiance Roland Leighton, and their friends Victor and Geoffrey to the front lines. In London, Malta, and France, Vera tends to the war’s victims and shares with us a woman’s point of view on falling in love, the horrors of war, and tragedy in difficult times.